This is an anthology of five stories set in the same steampunk universe, in which the Faraday effect is used to nullify gravity, thus allowing both air-breathing flight and spaceflight. There are also colonies on Venus and Mars and several space stations.The existence of the colony on Venus requires (given what we now know about Venus) a degree more suspension of disbelief than is usual as we have to ignore what we know to be true: that Venus has a mean surface temperature of 462 degrees C, and atmospheric pressure at the surface 92 times greater than earth, making human colonisation highly unlikely. However, the steampunk genre leans heavily on the legacy of Victorian science fiction writers, in which trips to Venus feature regularly (Voyage to Venus, Journey to Venus, A Trip to Venus etc), so this is forgivable.The HaemophageOn a mining base in the asteroid belt, people start dying by having their blood sucked out. The main character, the station's security chief, must solve the murders - his job made more difficult (or not?) by the arrival of a mysterious woman. I particularly liked the setting of this one, and would like to read more about the main characters, both of whom were more interesting than could be properly explored in the word count allowed. The murders were rather slow to appear and the resolution was rather quick, but still a very enjoyable story - admirably fitted, I think, to being the prequel to a full-length novel. Hint, hint.Taking the CureThe main character, a young ensign on his first deployment, is faced with a bigger problem than any ensign should have to cope with. This was one of my two favourites in the book. It's the kind of story where the impact doesn't really hit you until about half an hour after you've finished reading it. Then you realise that the motives of one of the characters could be read in two entirely different ways - putting a completely different spin on the ending. Very, very good. This, I think, is going to stay with me for a while.Iron CurtainMy other favourite. The main character, not a military type like his brothers, goes to Russia to build a "Faraday Floor" for the Czar's family. This is the story of a young man whose unaggressive attitude is a disappointment to his family, but who is determined to make his own way and earn enough money to marry the woman he loves. The relationship between the two young people was done well, and the ending was just right, I think. It didn't have quite the delayed impact of Taking the Cure but it had a depth that ensures it stays with you.Dear PrudenceGirl meets boy. Misunderstandings ensue. Etc. My least-favourite story in the anthology. I thought the two young lovers were each equally wet and annoying (but the dog was quite amusing). Luckily, the rest of the anthology makes up for it. This is also the only story that had virtually no steampunk element. Although airships and a couple of gadgets were mentioned, they were not important to the story and could have been removed without much trouble. In fact, it occurs to me that the reverse could equally have occurred: the steampunk bits added afterwards, to make a standard historical romance fit into a steampunk anthology.The ComputationerGilda Dettwiler needs a Babbage Analytical engine. An air-plane which crashed within a few miles of her home probably has one on board; if she can salvage it, it might solve several of her and her family's problems. This one is a straightforward Boys' Own (or maybe Girls' Own!) adventure, with dangers both human and natural, and unexpected allies. A quick, enjoyable read, and a good one to round off the anthology, ending it on a high note.Overall, a solid four stars. A seriously recommended read if you like your steampunk with a bit of depth to it - particularly Taking the Cure and Iron Curtain. Five very enjoyable stories. When reading anything that falls into the genre of Neo-victorian Steampunk, one thing that I’m looking for is the feeling that what I’m actually reading is a work of Historical Fiction, all be it an alternative history. 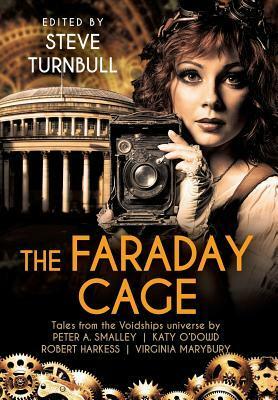 The world has to be believable, and all five stories included in The Faraday Cage pretty much nail that. Even the first two, which are set in space, still capture the typical Victorian sensibilities and settings. Peter A. Smalley’s work, particularly, captures the essence of a journey via cruise-ship, all be it one that travels ‘through the void’.Some readers may be thrown a little by these opening stories, especially if they haven’t read any of Steve Turnbull’s other works, set in the Voidships universe, but the leap to steam based space travel isn’t a massive one to make, once you have some understanding of the technology involved. Basically, Faraday Technology is based on scientific principles demonstrated by Michael Faraday in the mid-nineteenth century, when he showed a way to partially nullify gravity. This ultimately led to the development of lighter than air travel and ‘voidships’.One thing that really draws me to these stories, though, is the way that each author has given their own unique twist on the alternative ways this technology could be utilised, such as its therapeutic benefits, in Virginia Marybury’s story, Iron Curtain, and Peter A. Smalley’s work Taking the Cure (Although in that case, in typical Victorian fashion, its benefits may be a little misguided). Katy O’Dowd and Steve Turnbull’s story, Dear Prudence also has therapeutic uses for the technology, but it does hint humorously at more cosmetic application when combined with feminine corsetry. Katy O’Dowd and Steve Turnbull’s work also explores the effects that this new technology would have on the world, both the economic, and, by definition, the social ones. V Marybury’s story explores the possible wartime applications of the technology, and the way in which disreputable individuals could turn ignorance of it to their advantage.The really great thing in all the stories, is that the technology does not hog the limelight. In them all, the characters, and the plots, are engaging, and the world that Steve Turnbull has created acts as a backdrop to all of the author’s individual creativity.I would say that this book is a must-read for all fans of well-conceived, believable Steampunk. A collection of five stories set in the same steampunk world, but which all have very different themes and styles. This is a really interesting collection, full of original approaches to the steampunk genre. I particularly enjoyed ‘The Iron Curtain’ by Virginia Marybury. Instead of focusing on the usual vehicles and war machines, the story’s lead character is a coward who hates war and uses his expert mechanical skills to help others overcome disability. The story is interwoven with elements from real history in the alternative history setting. Another high point was ‘The Computationer’ by Steve Turnbull, a story of a young woman who dreams of programming Babbage analyticals one day, just like her hero, Ada Lovelace, and who goes to extreme lengths to try to get her hands on her own computer. This is a collection of short stories based around the same Faraday Cage technology. Of the five stories, I really enjoyed Dear Prudence (for its rompy fun) and The Computationer (for the unusual Fremantle setting). Excellent steampunk collectionThe stories are original, well written and engaging. The world is consistent and believable. I hope to see more stories from the Voidship Universe soon. A great anthology based in the Voidships universe. Interesting to see each author's work, and how it works within the creative framework. Excellent reading!